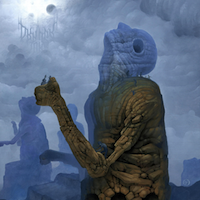 What can be said about UR DRAUGR that hasn’t already been said by the cover of this album “With Hunger Undying”? I mean just take a moment to be awed by such a grandiose and harrowing image. UR DRAUGR, who are from the island continent of Australia, reflects their nation’s beauty in their cover art and their music. But although the soft musical interludes, the atmosphere is tinged, poisoned almost, with the vileness of the darkest sounds of Death Metal. The band is a collaboration of several already active members of the Perth extreme metal scene. Guitar player Dean Lockhart happens to be in a Brutal Death Metal band called CORPSEBITCH; drummer Dan “Maelstrom” Grainger has played before in Black Metal bands like WARDAEMONIC, Technical Death Metal bands DEATHFUCKINGCUNT, and Singapore-based band IMPIETY; and lead singer Drew Griffiths formerly fronted the Progressive Metal band MORPHICA. These three musicians have differing backgrounds that all blends together into the amorphous mass that is UR DRAUGR. “With Hunger Undying” is actually the second release from the band this year. UR DRAUGR turned a lot of critic’s heads with their debut EP “The Wretched Aesthetic” that dropped this summer. To delve further into the infestation of inhuman carnage, listen to the album’s self-titled closer “With Hunger Undying”. It’s a mutated creation of black, death, thrash, and doom metal styles thrown together. Although there are brief moments of levity on this record, by the end of this record UR DRAUGR refuses to let its listeners down gently at all. The blasting forces of dark and twisted melodies of this song will definitely be flung through your speakers. There’s also a great acoustic folk guitar at the outro that accents this otherwise demonic song. Each song on this record takes an interesting direction in the moods the song-writing styles take you into. The guitar playing itself emits this tense, rabid ferociousness that follow the drumming that, when it gets more creative, pushes the guitar to come up with more off-the-wall riffs and complex chords. The vocals from UR DRAUGR’s lead member Drew Griffiths pass through distant clean vocals to screaming vocals that also sound like they’re coming from the top of a mountain getting shouted down at us. The performances on this album are undeniably powerful and the way it continues to refresh the movement of the songwriting keeps the music interestingly inhuman. There is no formula you can follow that will bring you close to writing songs like “Fertile Crescent” or “Cult of the Greatwurm”. Overall, “With Hunger Undying” is a petty nasty beast for anyone to put themselves up against. Although I really liked this album, I didn’t get into it as deep as I would get into a Progressive Black or Death Metal band. But personal bias aside, this album is totally worthy of a listen and had a lot of songs that I enjoyed.